As the leading environmental publisher, Island Press is committed to spreading ideas that inspire change. Sometimes, that means taking those ideas straight to lawmakers. 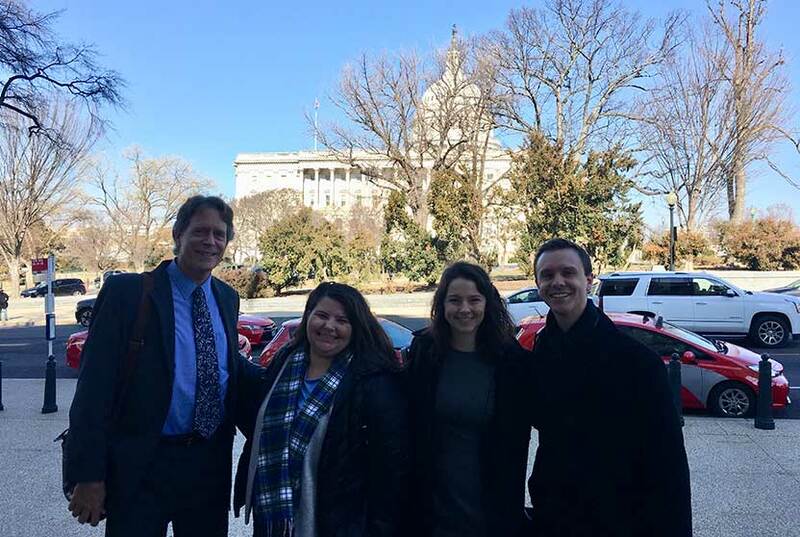 On February 8, Island Press partnered with Congressman Jared Huffman's office to co-sponsor a briefing on Capitol Hill on water scarcity and sustainable infrastructure. 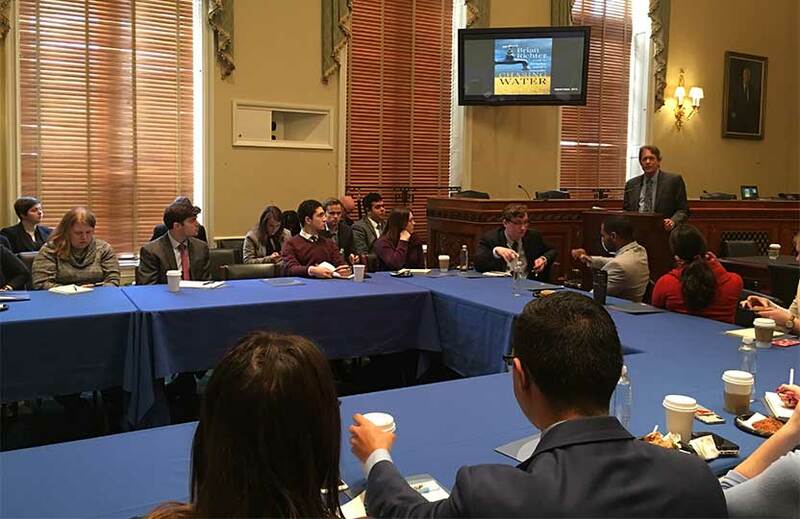 The briefing brought Brian Richter, a global leader in water sicence and conservation and author of Chasing Water, to Washington, D.C. to discuss water issues and policy with over 50 congressional staffers. We sat down with Richter to "debrief" the briefing, learn more about the key idea he hopes policymakers took away from the briefing, and discuss why he considered the event to be a resounding success. Have more questions for Richter or ideas for other Island Press briefings? Share them in the comments below. What role do expert scientists and professionals play in the policy process with lawmakers? I think it’s critically important for scientists to identify problems existing in our world and to communicate them effectively. But it’s equally important to help design pragmatic responses or solutions to the problems. Here’s an example. In 2016, I published a paper with colleagues that very clearly pinpointed the places in the world where water shortages were occurring and documented that irrigated agriculture was consuming 85% of the water in those places. An obvious solution is to get irrigation farmers to use less water, while sustaining agricultural production. Last year, I worked with a team of researchers to identify credible, well-documented ways for farmers to save water and we published a paper to tell that story. Now it’s time for policymakers to incentivize implementation of those water-saving approaches we’ve identified! Do you have any hope for how your briefing might impact future water infrastructure policy? I’m always hopeful! But I’m also quite cognizant that, for some reason, human societies lack the ability to proactively respond to crises that are slow to develop, like water scarcity or climate change, no matter how strong the science and how destructive the consequences may eventually become. The history of water policy reforms suggests that legislation moves forward only when crisis is imminent, or when we’re in the thick of it. That’s why so many of us in the water community feel conflicted when a serious drought is emerging, such as we’re seeing in California and the Colorado River basin presently. We secretly pray for things to get bad enough to provoke legislative response, yet we don’t want people and ecosystems to get hurt in the meantime. Since the publication of Chasing Water in 2014, US politics have become even more polarized and contentious. Did the current political climate impact your presentation in any way? Your expectations from the audience? I think public attitudes about the environment and the economy have been shifting for a long time now. In the 1990s, biodiversity conservation was receiving a lot of attention, and you could make the case for sustainable water management using endangered species as a central argument for leaving water in rivers. I think that’s why the book Rivers for Life that I wrote with Sandra Postel in 2003 was well received at the time. But since the turn of the millennium, and particularly since the economic crisis of 2007-2008, I’ve found that my nature-based arguments are not nearly as resonant as economic arguments for sustainability. That’s why my presentation emphasized the economic consequences of water scarcity. I have always believed that if we truly managed our natural resources in an economically sustainable manner, our ecological systems would be in much better shape. Even though I say “biodiversity” or “nature” much less frequently now, I will always be a nature boy at heart. Why is it so important to think about water shortages and managing water supplies at a local level? How can federal legislation help encourage this thinking? This does not mean that state or national governments or technical experts should not be involved, of course. In fact, they are usually essential in empowering local citizens with relevant information or data, or interpreting the laws that govern water. But history has clearly shown that the most sensible, robust, and durable water decisions are those seasoned with local input. There was a lively question and answer session after your presentation. Did any particular question stand out to you? What key idea do you hope staffers took away from your briefing? Water scarcity is ravaging our economies and our ecosystems, and we need stronger rules and incentives to help us live within the limits of available, affordable water supplies. Did you consider the briefing to be a success? Why or why not? What role has Island Press had in helping to share your expertise with key audiences? You never know when you throw seeds into the wind whether they will take root. But the session was extremely well-attended, and the Q&A session was very lively. The staff at Island Press did a fantastic job in arranging the session and in promoting it. They made it easy for me to show up and say what I wanted to say, and to go away feeling like it was a worthwhile investment of my time. Watch a video recording of Richter's briefing here.